I was excited to use ThinkFree to collaborate on the specification for the project I was working on with the lead developer and allow sponsor to see the progress. Couple of good things about the app: 1) its compatibility with MS Office format documents was stellar and 2) the interface was fast and pretty convenient. However, here's some flaws I've found: 1) the file locking meshanism is deficient. It will not tell me that the file is being edited before I open it. 2) file sharing preferences are only available on the file level - I would expect to see directory level preferences. And finally... the reason we stopped using it for our project was because it was not 100% reliable - a few times it corrupted the document :( This kind of stuff just can not happen for critical documents that several people work together on. My other observation is that this kind of application should not be standalone.. It will fit in perfectly within a bigger collaborative project environment that has things like project calendar, tasks and other project related items. If you have multiple people collaborating on a document, that by definition is a project. The other thing these guys need to figure out how to do is to auto-save a local copy of the document on the writer's PC. There's absolutely no way you can afford to ever loose your work. One of the new categories in the emerging Office 2.0 applications is being coined as "situated software". This class of software allows non-techies or rather "semi-techies" create their own mini applications without dragging in the IT department. These mini-applications range from simple registration forms, to more complex databases. Having given a few a cursory look, I decided to test out DabbleDB. I need to say that I was impressed. This app makes sense! See, instead of starting out as you would in IT by analyzing the problem to death, coming up with a data model, then building an interface (which would typically take 3+ months), what Dabble DB allows one to do is to EVOLVE the application. To tell you the truth I expected more from WebEx. It seems to have quite a few features at the first glance (calendaring, contact management, custom databases, forums, email), however it lacks the refinement of a good 2.0 application. Practically every link is a page reload which is annoying.. To use email you have to get one from WebEx. There's an ability to send email to groups but no email automation. To enter an appointment on the calendar, you have to jump screens. 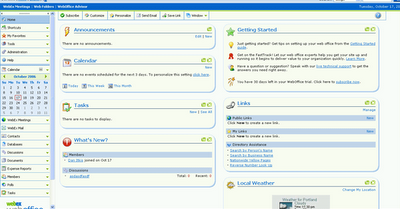 On the plus side, the layout is neat and clean. Something else that disturbs me is that they haven't made any changes since last time I saw it (about 3 months ago), makes me wonder how seriously they are treating this project. With that said, I'm giving WebEx WebOffice a 2 star ranking. Coming from an established company I expect more. Relenta (www.relenta.com) makes emphasis on Email being at the center of it all, which is a valid angle. 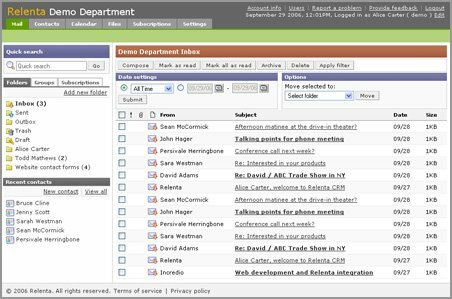 They make good use of groups to enable distributions (email campaigns) and nailed down the concept of departments pretty well with the ability to share contacts and calendars. Relenta email works by connecting to the existing mailboxes, which is the way to do it. Design is pretty good and makes fairly good use of layers to avoid reloads (although could use more). Calendar items currently have to be linked to the contact file (which is limiting) and I didn't see support for iCal subscriptions, which I think is a must for any web-based shared calendar these days. To round this up, with the addition of web forms to digest prospect data from a web site contact form (which they said they would have in under 2 weeks), this is definitely a viable contender for the Office 2.0 app. I'm going to give Relenta 4 stars as they are on the right track. Update: As of late November 2007, Relenta added a web form post mechanism, making it possible to collect customer lead data from the web site. This is a significant improvement in making Relenta a serious contender in the lead management/email marketing space.